Israeli forces continue systematic crimes in the occupied Palestinian territory (oPt) for the week of 12 – 18 October, 2017. 20 Palestinian civilians, including 14 children, were wounded in the West Bank, Jerusalem and the Gaza Strip. During the reporting period, Israeli forces wounded 20 Palestinian civilians, including 14 children; 4 of them including a child were in the West Bank while the 6 others, including 3 children, were in the Gaza Strip. In the Gaza Strip, Israeli naval forces continued to chase Palestinian fishermen in the Sea and open fire at farmers and houses in the border areas. The fishermen in the Sea were subject to 12 shooting incidents during the reporting period. In the West Bank, 15 October 2017, a 13-year-old Palestinian child sustained shrapnel wound to the left leg when Israeli soldiers fired live and rubber-coated metal bullets, sound bombs and tear gas canisters at a group of youngsters and students, who threw stones at the soldiers after their incursion into Rojib village, southeast of Nablus. On 16 October 2017, a young man was wounded to the foot when Israeli forces moved into al-Dheishah refugee camp, south of Bethlehem, and opened fire. On 18 October 2017, 2 civilians were wounded in Nablus and Ramallah following the Israeli forces’ incursion into the cities and closure of 8 media offices. In the Gaza Strip, the border areas witnessed protests against the on-going unjust closure on the Gaza population. During the protests, the Israeli forces used force against the protestors and opened fire in order to disperse them. As a result, 6 civilians, including 3 children, were wounded; Five were wounded in eastern Jabalia and the other in al-Brueij refugee camp. In the pretext of targeting Palestinian fishermen in the Sea, PCHR monitored that Israeli forces escalated their attacks against Palestinian fishermen in the Gaza Sea although declaring fishermen are now allowed to fish until 9 nautical miles instead of 6. This proves that the Israeli forces continue their policy of targeting fishermen and their livelihood. During the reporting period, Israeli gunboats chased and opened fire at Palestinian fishing boats 12 times; 11 of which were in the north-western Beit Lahia and western Soudaniyah, west of Jabalia in the northern Gaza Strip and one was off Kahn Younis shore in the southern Gaza Strip. On 15 October 2017, 4 fishermen were arrested off al-Wahah shore, northwest of Beit Lahia, and 8 fishing nets were confiscated. The arrested fishermen were later released. On 17 October 2017, Israeli gunboats fired shells at a Palestinian fishing boat sailing within 2.5 nautical miles. As a result, the boat was destroyed and drowned in the Sea. It should be mentioned that the Ministry of Agriculture said that Israel informed the Ministry of Affairs that the allowed fishing area expanded from 6 to 9 nautical miles starting at 15:00 on Wednesday, 18 October 2017. In the context of targeting the border areas, on 13 October 2017, Israeli forces stationed along the border fence between the Gaza Strip and Israel, east of Khan Younis in the southern Gaza Strip, sporadically opened fire at the agricultural lands, east of Khuza’ah village and al-Sunati area in ‘Abasan al-Kabirah. As a result, farmers and civilians panicked, but no casualties were reported. On 15 October 2017, Israeli forces stationed along the border fence between the Gaza Strip and Israel, east of al-Maghazi in the central Gaza Strip opened fire at the lands and houses in the eastern areas. No casualties were reported. During the reporting period, Israeli forces conducted at least 47 military incursions into Palestinian communities in the West Bank. During those incursions, Israeli forces arrested at least 50 Palestinian civilians, including 8 children. Six of those, including a child, were arrested in Jerusalem and its suburbs. As part of the Israeli attacks against media, on Wednesday, 18 October 2017, Israeli forces closed 8 branch offices of 3 media companies in the West Bank, providing media services in Nablus, Hebron and Ramallah. These companies are PalMedia, Ram Sat, and Trans Media, noting that the offices are rented by the channels of al-Quds, Al-Aqsa and Palestine Today. Israeli forces confiscated the broadcasting devices and equipment and closed the offices for 6 months without identifying the reasons in addition to arresting 2 journalists from Hebron. These attacks are part of systematic steps to silence the voice of truth and cover up the serious violations of human rights in the oPt. In the context of Israeli settlers’ attacks against Palestinian civilians and their property, dozens of settlers continued to raid al-Aqsa Mosque and its yards in East Jerusalem’s Old City under the Israeli forces’ protection and provoking Palestinians there. As part of settlers’ attacks against Palestinian civilians and their property, on 12 October 2017, hundreds of settlers under the Israeli forces’ protection moved into several neighbourhoods in occupied East Jerusalem’s Old City coinciding with the last days of the Jewish Sukkot Holiday. They attacked shops and damaged 4 vehicles and a motorbike in al-Wad neighbourhood in the Old City. They also moved into the African Community neighbourhood near the Council “al-Majles” Gate, one of al-Aqsa Mosque’s gates, and threw stones, sticks and chairs at the houses’ doors and windows in the neighbourhood. On 16 October 2017, the Israeli authorities declared seizing dunums from al-Ta’amrah lands, east of Bethlehem. 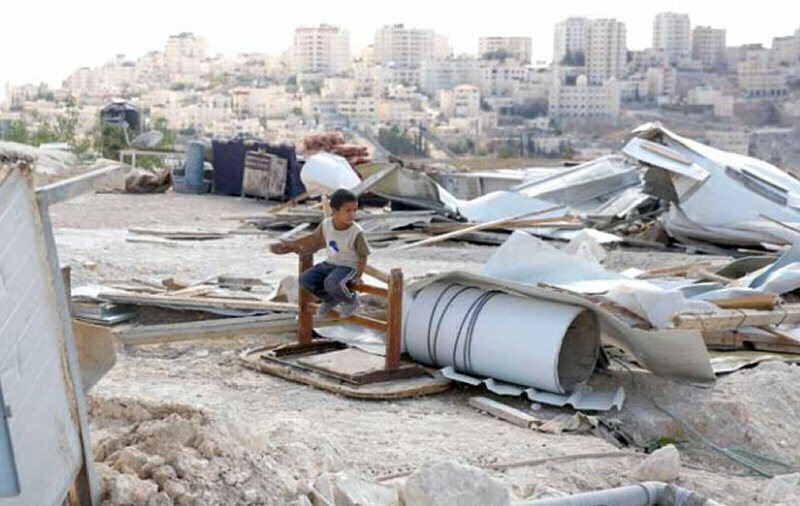 On 17 October 2017, the Israeli municipality bulldozers demolished 2 houses in Yasoul Valley neighbourhood in Silwan village, south of East Jerusalem’s Old City, without any prior warning under the pretext of building without a license. Meanwhile, the Israeli forces were preparing to demolish a third house but the demolition was delayed after its owner resorted to the Israeli court. At approximately 13:30, following Friday prayer on 13 October 2017, dozens of Palestinian civilians and international activists organized a protest in Kafer Qadoum village, northeast of Qalqiliyah. They made their way to the eastern entrance to the village in protest against closing that entrance since al-Aqsa Intifada. When the protestors approached the abovementioned entrance, the Israeli forces fired rubber-coated metal bullets, tear gas canisters and sound bombs. As a result, a number of civilians suffered tear gas inhalation. At approximately 15:00 on Friday, 13 October 2017, dozens of Palestinian youngsters made their way to the border fence between the Gaza Strip and Israel, east of al-Bureij refugee in the central Gaza Strip, in solidarity with Jerusalem and protesting against the Israeli violations in al-Aqsa Mosque. About 30 youngsters gathered near the security fence and threw stones at the Israeli soldiers stationed along the border fence. The soldiers fired live bullets and tear gas canisters at the protestors. As a result, a 17-year-old child, from al-Buraij refugee camp, sustained a live bullet wound to the right foot. He was transferred to Shuhadaa’ al-Aqsa hospital in Deir el-Balah to receive medical treatment. His wound was classified as moderate. At approximately 16:00 on the same Friday, dozens of Palestinian youngsters made their way to the border fence between the Gaza Strip and Israel, east of Jabalia in the northern Gaza Strip, protesting against the Israeli closure and violations on the Gaza Strip. Some of the protestors threw stones at the Israeli soldiers along the border fence. The soldiers fired live bullets, rubber-coated metal bullets, and tear gas canisters at the protestors. The shooting and clashes sporadically continued until approximately 18:45 on the same day. As a result, 5 civilians, including 2 children, were directly hit with tear gas canisters. They were transferred to the Indonesian Hospital in Jabalia, and their condition was classified as minor. Note: PCHR Keeps the names of the wounded persons. At approximately 01:30 on Thursday, 12 October 2017, Israeli forces moved into ‘Ain al-Louza neighborhood in Silwan village, south of occupied East Jerusalem’s Old City. They raided and searched a house belonging to Bahaa Ahmed Abu Tayieh (20) and arrested him. In the evening, Israeli forces turned al-‘Issawiyia village, northeast of occupied East Jerusalem, into a closed military zone. They also fired live bullets and rubber-coated metal bullets at the village residents. Activist Mohamed Abu al-Humus said that, on Thursday, hundreds of Israeli soldiers moved into al-‘Issawiyia village, where they heavily fired sound bombs, tear gas canisters and live bullets. They also turned the village into a closed military zone by closing all streets, surrounding the village, and imposing curfew. The Israeli soldiers also arrested Mohamed Abed al-Raaouf Mahmoud (17) while he was in a car at the village entrance. Due to firing the tear gas canisters, dozens of civilians suffered tear gas inhalation. Moreover, the closure imposed on the village, especially at the eastern and western entrances to the village; firing sound bombs and metal bullets at vehicles and residents; topping at houses’ roofs; and stationing in many neighborhoods caused a state of tension and anxiety in the village. At approximately 23:20, Israeli forces moved into Sho’fat neighborhood, north of occupied East Jerusalem’s Old City. They raided and searched a house belonging to Abed al-Raheem ‘Isaa (24) and arrested him. At approximately 16:00 on Sunday, 15 October 2017, Israeli forces moved into al-‘Issawiyia village, northeast of occupied East Jerusalem. Israeli soldiers deployed in many neighborhoods and confiscated flags and banners, which were hanged on walls for welcoming prisoners. They also pushed and beat up Yousef Muhasin, his wife Fadia and their daughter Salsabil while they were near al-Salam Amusement Park at the northern entrance to the village. Yousef was arrested and then taken to Salah al-Deen police center for investigation. PCHR’s fieldworker said that Yousef’s wife and his pregnant daughter were taken to hospital to receive medical treatment due to sustaining bruises. Moreover, the Israeli forces removed a banner for welcoming the prisoner Nimer Mahmoud and confiscated it. They also confiscated flags for welcoming the prisoners Mahmoud and ‘Ata Mohamed Derbas. The Israeli forces also moved into al-‘Issawiyia village cemetery in an ongoing violation of the sanctity of the dead persons. At approximately 13:00 on Monday, 16 October 2017, a large force of Israeli soldiers moved into Qalandia refugee camp, north of occupied East Jerusalem. They searched houses and shops from which they confiscated surveillance cameras and arrested civilians, who were later released. The Israeli forces raided and searched a house and a toys shop belonging to Ziyad ‘Afanah after damaging the door locks and then arrested him. Clashes erupted between Palestinian young men and Israeli soldiers, who heavily fired rubber-coated metal bullets, sound bombs and tear gas canisters at an UNRWA school for girls, causing fear among female students. The Israeli soldiers topped the houses roofs and deployed snipers before their withdrawal. At approximately 13:30, a large force of Israeli soldiers moved into the schools street in the center of al-‘Issawiyia village, northeast of occupied East Jerusalem. They heavily deployed in the area and indiscriminately fired rubber-coated metal bullets and sound bombs at the students when students were leaving their schools. As a result, 10 students, who are between 9 and 16 years old, were hit with sound bombs and rubber-coated metal bullets and sustained shrapnel wounds. Mohamed Abu al-Humus, Member of al-‘Issawiyia Follow-up Committee, said that Israeli forces raided al-‘Issawiyia village and wounded 10 students who are between 9 and 16 years old while getting out of the school. The students sustained wounds to the face, limbs, abdomen and waist. All of them were then taken to hospitals and clinics. Moreover, dozens of students were afraid due to raiding the main street near their school by the Israeli soldiers. Abu al-Humus added that one of the wounded persons was transferred from al-Maqased Hospital to Sha’arei Tzedek Hospital in the evening. It should be noted that the abovementioned wounded person was hit with a rubber-coated metal bullet to the waist and his health condition was serious as his spleen was removed. Abu al-Humus also said that the Students’ Parents Committee decided to suspend the school day in all schools in al-‘Issawiyia village until further notice in protest against the Israeli forces’ daily incursions coinciding with the start and end of the school day. He said the Israeli forces are trying to provoke and intimidate the students and erupt clashes. At approximately 01:00 on Tuesday, 17 October 2017, Israeli forces moved into al-Sa’diyia neighborhood in occupied East Jerusalem’s Old City. They raided and searched a house belonging to Salah Sharifah (22) and arrested him. On Tuesday, 17 October 2017, the Israeli Municipality bulldozers without a prior warning demolished 2 houses in Yasoul Valley neighbourhood, south of occupied East Jerusalem’s Old City, under the pretext of non-licensing. The bulldozer also started to demolish another house, but the demolition decision was delayed because its owner went to the Israeli court. According to PCHR’s investigation and eyewitnesses’ statement to PCHR’s fieldworker, on Tuesday, Israeli bulldozers accompanied with the Israeli Municipality staff moved into Yasoul Valley neighbourhood and stationed in Abu Tayieh area. They then demolished 2 houses belonging to Abu Rajab family. Omar Abu Rajab said to PCHR’s fieldworker that the Israeli bulldozers demolished his house and his brother’s house, Raied, after fully surrounding the houses. He added that the demolition was carried out although the judge has not yet considered the appeal submitted by the family lawyer. He also said that the family had a decision to delay the demolition, but the Israeli municipally staff refused it and carried out the demolition without a prior warning. Abu Rajab said that the two houses were built 14 months ago, and the Israeli Municipality handed them the demolition decision in last April and from that time the demolition decision was delayed several times. Lately, a hearing was held to delay the demolition and the judge has not yet considered the decision, pointing out that the family submitted the documents requested by the court and began the licensing procedures. Abu Rajab also pointed out that his family told him about raiding the house to demolish it when he was in his work. When Abu Rajab returned, he could not enter his house or helping his family in vacating the contents due to the closure imposed on the area. He added that they demolished the houses without vacating all the contents. It should be noted that the house sheltered 9 persons, including 2 children, and after demolishing the house, Abu Rajab family set a tent in front of their house rubble. The family became homeless due to the demolition. In ‘Ain al-Louza neighborhood, Israeli forces raided a house belonging to Sha’ban Abu Tayeh and completely surrounded his house. The Israeli Municipality staff vacated the house contents to demolish it under the pretext of non-licensing. The house’s owner managed to delay the demolition decision after he resorted to the court. Two hours later, the Israeli forces withdrew from the neighborhood. On Thursday, 12 October 2017, hundreds of Israeli settlers, under the Israeli forces’ protection, moved into many neighborhoods in occupied East Jerusalem’s Old City, concurrently with the latest days of Jewish Sukkot Holiday. The Israeli settlers attacked shops and damaged 4 vehicles and a motorcycle in al-Wad neighborhood. They also moved into the African Community neighborhood and threw stones, chairs, and sticks at the houses’ doors and windows. Dozens of Palestinian young men gathered to stop the Israeli settlers’ attacks. As a result, 4 Palestinian civilians sustained wounds and fractures while Ya’qoub al-Dabbagh (13), was arrested. Eyewitnesses said to PCHR’s fieldworker that the Israeli settlers severely beat up Ibrahim al-Hashlamoun, raided his shop and damaged its contents in Al-‘Amoud Gate area. They also raided a house belonging to Maher Abu Isneinah on al-Wad Street. Eyewitnesses added that the Israeli forces only moved the Israeli settlers away from al-Wad Street and when the settlers arrived at al-Amoud Gate area, they beat Ibrahim up after raiding his shop. In next day morning, the Israeli settlers organized a demonstration on al-Wad Street, while the Israeli forces heavily deployed in the area. The Israeli settlers also established iron barriers on roads and obstructed the civilians and traders’ movement. On Monday, 16 October 2017, the Israeli authorities declared seizing many agricultural dunums from al-Ta’amrah lands, east of Bethlehem. Hasan Braijah, Representative of Committee against Wall and Settlements in Bethlehem, said that the Israeli forces declared a military order holding No. 25/17 T, to seize of 3dumuns and 600 square meters in a plot of land No. 4 from al-Ta’amrh lands near “Nokdim” settlement, west of al-Ta’amrah lands. Hasan Braijah pointed out that the military order warns civilians of using the plot of land only through the Israeli forces, in which by this way the Israeli settlers will easily seize the land.